I've been using Spam Arrest for 3 weeks and I love it. It even has these little graphs showing how much good mail is coming and how much bad mail. 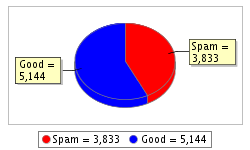 In 23 days it's saved me from almost 4,000 spam messages - an average of 166 each day! Jen darling - I definitely don't keep up! I try but it's becoming impossible. David, I am very sorry to tell you that we are not able to offer you a refund for your account. You may continue to use your Spam Arrest account till 2008-10-01 by reactivating the account. I truly apologize for your inconvenience, David. Please do let me know if you need anything else.